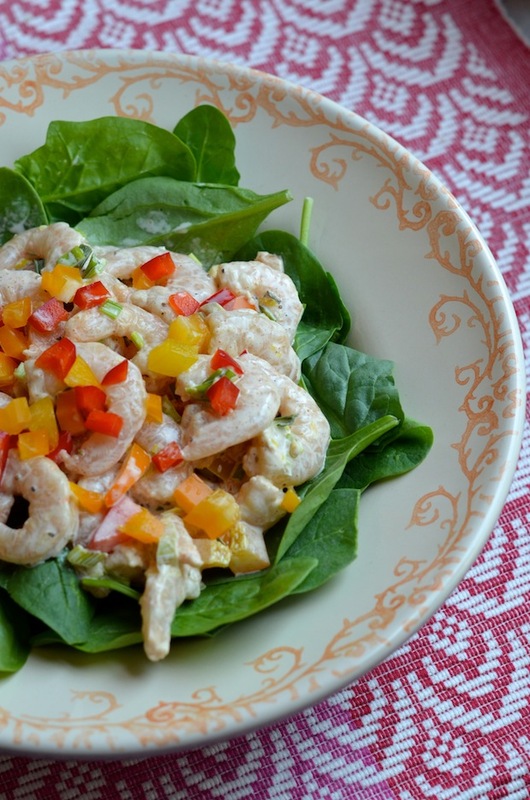 Brazilian Shrimp Salad + A Giveaway! While I admit that I have zero interest in soccer, one thing I did love about the World Cup was that it seemed to get people excited to explore new international recipes and flavors. As the host country, Brazil definitely (rightfully!) got the most culinary attention, and I loved being able to read about different Brazilian recipes and cocktails that people were enjoying while watching the games. Containing oregano, smokey cumin, fragrant white pepper, and heat from ground cayenne, it's a flavorful blend that adds instant kick to any dish, but is also super simple to make using these very easy to find spices. I include the proportions below for this recipe, but I totally recommend multiplying it, and making a big batch to use while cooking. You can use it on grilled meats, sauces, dips, and even salad dressings! Since it's summer (and hot!) I decided to make a Brazilian-inspired shrimp salad using the spices, and some other fresh seasonal flavors. With a creamy dressing and lots of color from fresh peppers and scallions, it's a bright and flavorful dish that's perfect for entertaining. It also makes AMAZING sandwiches--try stuffing it into warm, toasted hot dog buns for a twist on the classic lobster roll, or wrap it up inside a tortilla for an easy picnic lunch. You can even serve it as a main course for lunch or a light dinner by piling it over salad greens like I did here. 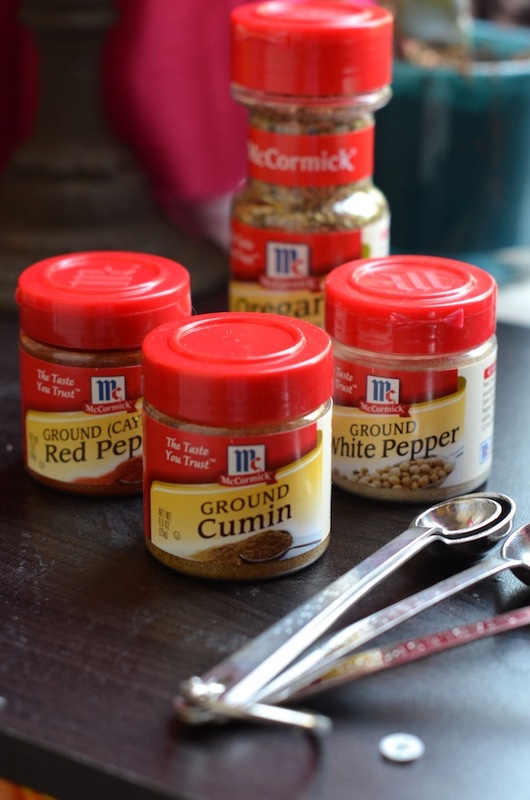 As part of this campaign, McCormick is giving away a $50 McCormick 125th Anniversary Prize Pack containing spices, a McCormick recipe book and a canvas tote. To enter to win, all you have to do is comment below with one of you favorite flavor stories of the season--whether that's a scoop of tart lemon ice cream or a juicy burger or a dish you remember from childhood. Tell me about the best thing you've enjoyed at home or while traveling and be sure to include the hashtag #flavorstory with your comment. For ever story shared, McCormick (who are currently celebrating their 125th anniversary!) will also donate $1 to United Way (up to $1.25 million) to help those in need around the world. And to read and share more fun food and flavor stories, visit flavoroftogether.com. RULES: US residents only. All entries must be in by 5PM EST on August 1st. One winner will be randomly selected and contacted via email. This post is sponsored by McCormick. Thank you for supporting companies like McCormick who make it possible for me to keep creating great content and recipes for you. In a separate small bowl, whisk together mayonnaise, yogurt, lemon, Bahian Blend, and kosher salt. Add dressing to the shrimp along with the diced peppers and scallions. Toss to combine, then cover with plastic wrap and let chill and marinate at least two hours. Serve shrimp salad with chips as an appetizer, in hot dog buns as sandwiches ("lobster roll" style), or on top of greens as a main course.